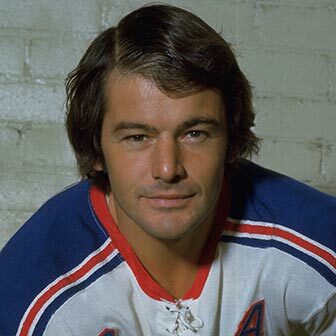 The first player to have his number retired by the Rangers organization and the only player to score more than 1,000 points in a Blueshirts uniform, Rod Gilbert enjoyed a brilliant 15-year run with the team and spent his entire Hall of Fame career as a Ranger. A native of Montreal, Gilbert joined the organization in 1957, when he began playing major-junior hockey with the Guelph Biltmores. He remained in Guelph for the next four seasons and led the OHA with 54 goals and 103 points in his final junior season of 1960-61. Gilbert played single games for the Rangers in both the 1960-61 and 1961-62 seasons, and in 1962, he made the team out of training camp for the first time as a 21-year-old. He would play 1,063 games for the team over the next 15 years, playing in a team record nine All-Star Games. In his 15 full NHL seasons, Gilbert broke 20 goals 12 times. He broke 30 goals five times and also had a career-best 43 goal season in 1971-72. Playing on the GAG (Goal-a-Game) Line with childhood friend Jean Ratelle at center and Vic Hadfield on left wing, Gilbert enjoyed his finest NHL season with 97 points in 1971-72 and played a key role in the team`s run to the Stanley Cup Finals. Gilbert matched his 97 points in 1974-75, a team record for right wings that stood until Jaromir Jagr broke it in 2005-06. Other records Gilbert continues to hold include career points by a Ranger (1,065) and career goals by a Ranger (406). Following his retirement in late 1977, Gilbert continued his association with the team, rejoining the Rangers in 1989 as head of the team`s Alumni Association. He remains part of the organization in the role of Director, Special Projects and Community Relations Representative. Gilbert`s No. 7 was retired by the Rangers organization on Oct. 14, 1979. Gilbert was also honored on the ice in March 1977 for playing in his 1,000th game with the Rangers.